Allow me to unfold, to unfurl. You’re welcome to do the same, so get comfy. This is a tender little telling of my mothering journey. Bali rekindled power and magic within me that was lost when Fern was born (more writing on that to come in the future). I hold this photo near and dear to my heart because it reminds me of how important it is, and how soul-level nourishing it can be, to make space. To practice being fully present. To be able to hear our own inner voice amidst the noise. To be able to sense and feel ourselves, in a chaotic world. Can you find that for yourself right now? What helps you be fully present, alive, aware? 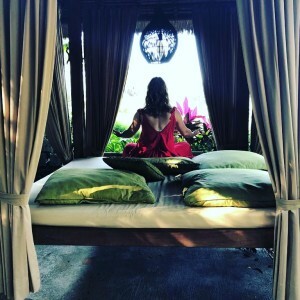 It made me curious to hear so many interpretations of why I went to Bali. People see me in a leadership role – and it’s the role I often find myself in. I’m grateful and I love it. Being a leader to me includes being a student, which is why I went wholeheartedly to attend, not lead, a retreat. I needed a break. Before I broke fully, preferably. Motherhood has been the most challenging and rewarding crucible of life experience for me, a true rite of passage. Often, I didn’t like how I responded. I’d never experienced much anxiety or rage, at least not on a rolling continuum r day to day experience like I have this first 18 months of mothering. This trip was part Hail Mary, an escape from the daily, and part tender acknowledgement of my own needs. I didn’t want to continue on the treadmill of emotions and hormones and depletion I felt starting to sweep me away, so I took what felt like radical action. I needed to be able to feel my own resonance, my Self again. We weaned. I anticipated. I cried. I arrived deep within myself, halfway around the globe, and purged what felt like lifetimes of sludge from my subconscious and renewed my spirit. I am mother. I am ready for what’s now, what’s next. In communion with the divine and the group of women around me. In deep rest. Visioning. ​​Basically, I went to Bali to allow myself to fall apart and be put back together in a new way. Mother. Leader. Friend. Wife. Business builder and writer as I let go of the freelance casual way of operating from my twenties. More fun, but more structure and maturity is needed from me now. I believe we all have a capacity to lead. We run households, grow families, and function within communities, companies, organizations, churches and more that give us a sense of belonging and also support us (ideally) in becoming our most authentic, courageous, useful human self. These are the ways in which we lead. We all know the planet and our politics desperately need us to make changes, to lead in a new direction. I’m going to just mention this program once, as I know it takes a special interest in women’s leadership, sisterhood and self growth to enroll in a program like this one. Nisha’s the reason I went to Bali, to attend her Soul of Leadership Retreat and I’ll gladly participate again in 2019 as an alum of her online program with the same namesake. It’s rich, nurturing and invokes growth. 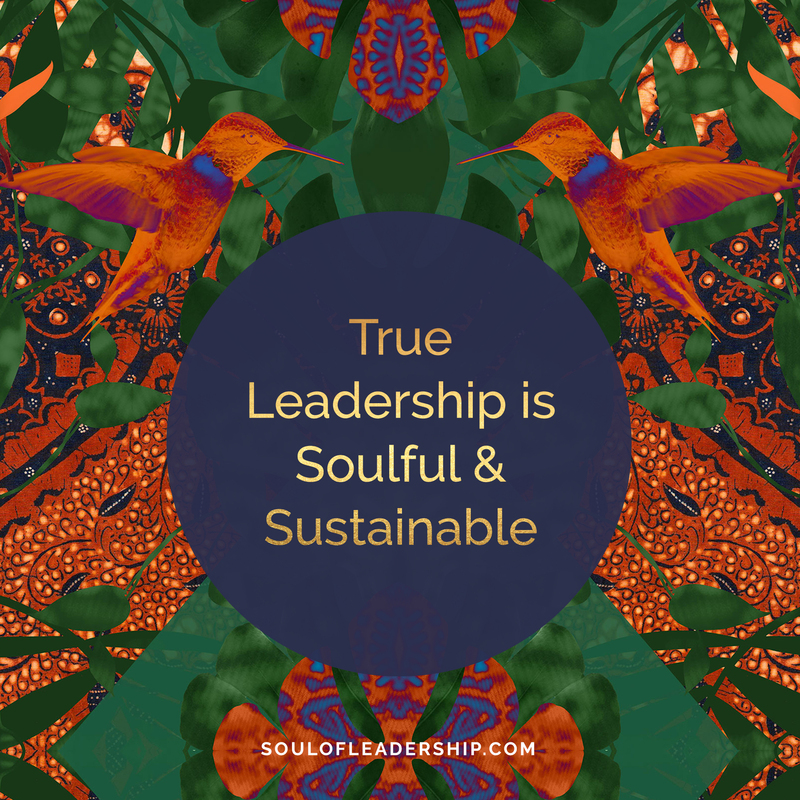 If you’d like to have a ‘book club’ or ‘women’s circle’ of sorts with me in 2019, I’d be honored to welcome you into Nisha’s world as you enroll in Soul of Leadership. I’ve already humbly welcomed one friend (yay!!!) into sweet communion with this work, and I look forward to connecting with her throughout 2019. Women, let’s continue to rise in our embodied leadership. You can ask me anything about my experience working with Nisha, this program, or how it could serve you. And, how fun would it be to have tea and talk through each module together through 2019? Do yourself a favor and at least peak at the beautiful texture and richness in her branding. 😉 Look at it right over here and take some deep breaths to feel into what this invitation could mean for you. To you. Here’s to women supporting women. Here’s to nurturing relationships with true staying power. Here’s to trusting our embodiment so we can speak up, stand tall and change the world. Thank you for reading, and I look forward to leading alongside you.